For some people at especially high risk of developing colon cancer, taking a couple aspirin a day appears to help protect them from the disease. A study in The Lancet finds that people with Lynch syndrome, a hereditary predisposition to cancer of the digestive tract, who took aspirin twice a day for a up to 4 years were about 60 percent less likely to develop colorectal cancer than those who got a placebo. Put another way, about 4 percent of the people taking aspirin got colorectal cancer compared to 7 percent of those getting the placebo over a follow-up period that averaged about 4 1/2 years. The study found the protective effect took a few years to become apparent. 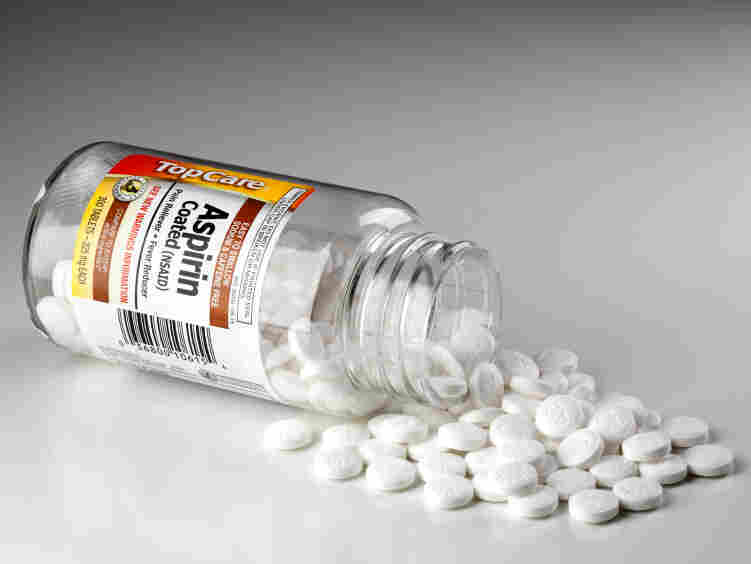 In fact, a 2008 publication of results by the same study group found no benefit to taking aspirin, but follow-up wasn't as long. The latest results sound promising, right? Well, don't run to the medicine chest without talking to your doctor. The U.S. Preventive Services Task Force, controversial as it can sometimes be, has a recommendation stretching back to 2007 that says the evidence doesn't support people at average risk fo cancer taking aspirin to prevent colorectal cancer. The benefits don't outweigh the risks. Aspirin carries a risk of gastrointestinal bleeding. And it can increase the risk for strokes. Those risks increase with the dose dose. The researchers for the Lancet study say the findings now support aspirin to help people with Lynch syndrome as the "standard of care." What's left to do is to figure out the right dose for those patients, probably a lower one than the 600 milligrams a day used in the study. What about everyone else? Well, the USPSTF recommends that people ages 50 to 75 get screened for colorectal cancer, which can reduce deaths from the disease.